What words come to your mind when you think of yoga? Stretching? Relaxation? Hippy? Maybe “OM!”? What about sensory input? The sensory benefits of yoga for kids are impressive! Yoga is a GREAT way to get proprioceptive (joints/heavy work) and vestibular (inner ear/balance) input. And it’s just plain fun. This post is part of the Sensory Summer series, hosted by Mommy Evolution in partnership with The Sensory Spectrum. Follow us all summer and visit our Sensory Summer landing page to get the latest sensory fun for your kiddos! This post contains affiliate links. Learn about how you can use yoga with your kids from Julie of My Mundane and Miraculous Life! Here are some of her family’s favorite yoga poses and some of their benefits. Stand upright with arms to the side or straight overhead. With one foot firmly planted, place the sole of the other foot flat against the sturdy leg. Placing the foot on the opposite ankle is the easiest. Bringing the sole of the foot up to the calf or even the thigh is more challenging. With palms and feet flat on the ground, bend at the waist. Keep the back flat and feel the stretch through the back of the legs as well as the shoulder blades. Your child should be looking at their knees. This one is great to do right before or after downward dog pose. Palms remain flat on the ground, while soles come off the ground so that the child is on their toes. Their back and legs should form one slope, instead of being hinged at the waist. 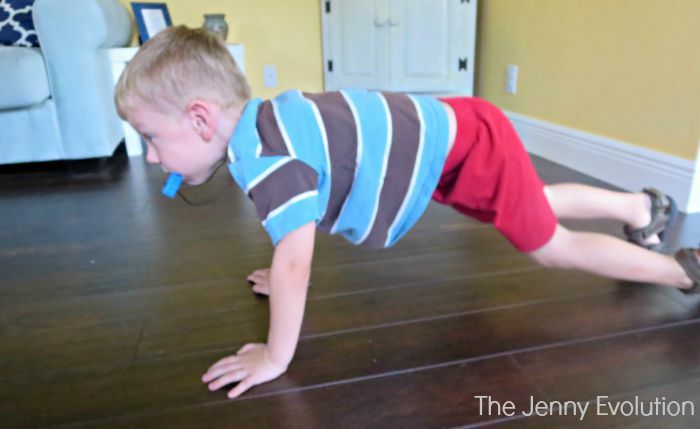 Benefits: Plank pose is excellent for heavy proprioceptive work. So many muscles are engaged to keep the body in position, especially the core muscles. The stronger a child’s core, the better control they will have of their bodies, even fine motor skills! While this may not be an official yoga pose, it should be! While lying on their backs, have the child curl all their limbs and head toward the center of their body. They’ll look like a balled up rolly polly. Benefits: This is another great one for the core. There’s also the added benefit of all the proprioceptive pressure on the back while they roll about. With hands flat on the floor, have your child tuck their legs underneath themselves, shins and the tops of the feet to the floor. The child can rest their forehead on the floor. Benefits: While there is some proprioceptive input with this one, it’s also extremely calming. Have your child focus on deep breaths. This is a great pose to get in during an especially stressful time. Your child may feel like they’re in a safe cocoon where they can work through their feelings. These are just a couple of the yoga poses you can do with your child, even at a young age. Go at their pace and comfort level. Keep things fun and lighthearted. Your child will be getting wonderful sensory input without even knowing it! This post is part of the Sensory Summer series, hosted by Mommy Evolution in partnership with The Sensory Spectrum. Follow us all summer and visit our Sensory Summer series page to get the latest sensory fun for your kiddos! 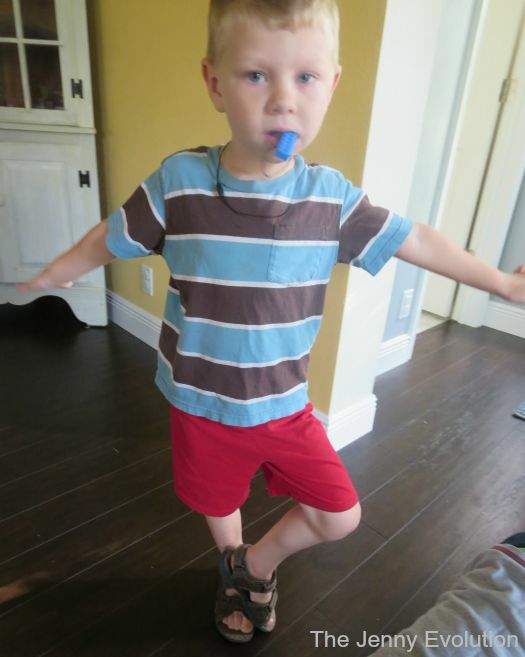 LOVE this post – real live kids in actual poses!!!! Great post. As a pediatric PT, I recommend yoga. It is so beneficial for children, requires no equipment and can be done in small spaces. You mentioned some wonderful poses especially for muscle strengthening and balance. I recently wrote a blogpost on 10 Reasons Why Yoga is Beneficial for Children at http://yourtherapysource.com/blog1/2015/06/18/10-reasons-why-yoga-is-beneficial-for-children/ You will find even more reasons why yoga is great for children’s sensory motor development. I never knew they had a dead bug pose – lol! Yoga for kids (or moms) is so great — love your pics! This would be great to incorporate into our homeschool curriculum this year! Thanks for sharing! Absolutely! Yoga can be the perfect break for kids when you’re homeschooling… I kind of wish they had it in the public schools, too. Yes, sometimes you have to try again with kiddos. You just never know. Great post. I started doing yoga with my kids a few months ago as part of their bedtime routine and love it. There are a couple of poses on here we haven’t tried yet. My oldest does a bit of yoga during school when they need to calm down after recess or during their gym class! Thank you for linking up at the Simply Sundays link party! So glad to hear that they do it in school! I wish ALL schools understood the benefits and did that throughout the day. What a wonderful and informative article! As a child and family therapist and yoga instructor, I find myself discussing the MANY benefits of yoga and mindfulness to both parents and their children all the time. 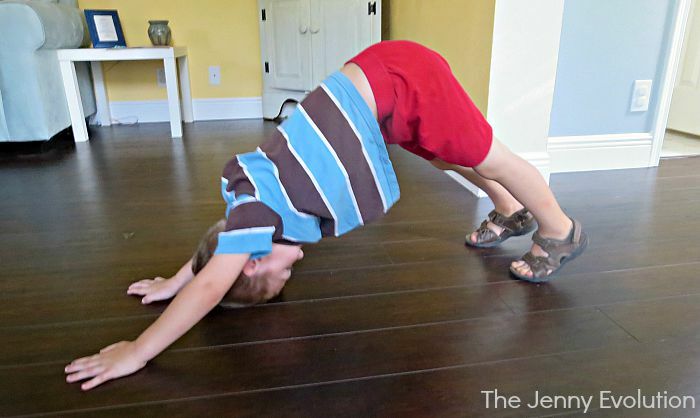 It’s great to have examples of how yoga can help with sensory integration, as well. I love yoga myself… it wasn’t a hit with my older kiddo but my younger one gets a kick out of doing the poses with me sometimes. How long do you have the kiddos sustain each pose? It’s not about counting to keep the kids holding the pose… particularly if they’re young. It’s about them moving to get to the pose and your child will set the pace. 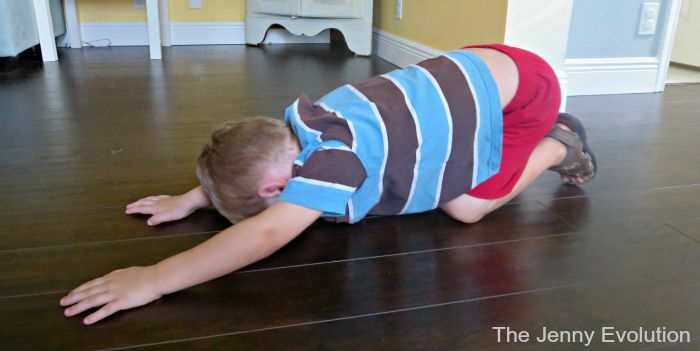 I know my sensory kiddo just wouldn’t slow down for yoga… despite the benefits, yoga isn’t necessarily for every kiddo.